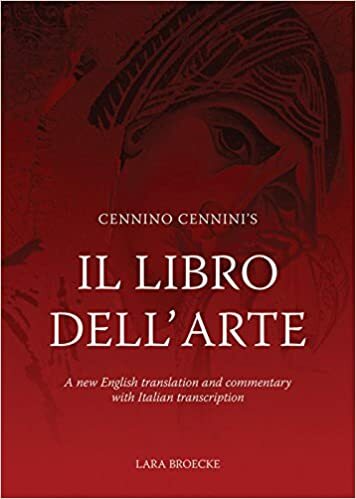 There's a new English translation of Cennino d'Andrea Cennini's "Il libro dell' Arte, by Lara Broecke, a professional paintings conservator and artist. more precisely what Cennino actually wrote, by correcting more than 400 errors in Thompson's text...In addition, the author's most informative introduction places Cennino in context and accounts for the genesis of the libro dell'arte by r eference to the society in which it was produced. With all those errors some may explain the problems some have recreating Cennini's recipes and techniques. While Broecke's book is lauded as a "landmark text" for art history students and professionals it is just the kind of book many SCA scribes will drool over. And maybe for a long time because $90 for 248, 6.9 x 9.7 inch, pages is steep. Especially since Thompson's 80-year-old version is cheap on Amazon and free on the web, although it takes effort to access on Notebook. Before you buy it, you may be interested in the International Institute for Conservation of Historic and Artistic Work's extensive review. With my retirement budget, my option to read this book will be interlibrary loan from my local library. The Barony of the Lonely Tower held their Arts and Sciences Championship Revel last Sunday. My favorite local event, designed to select the person who represents those activities to the Kingdom for the coming year. 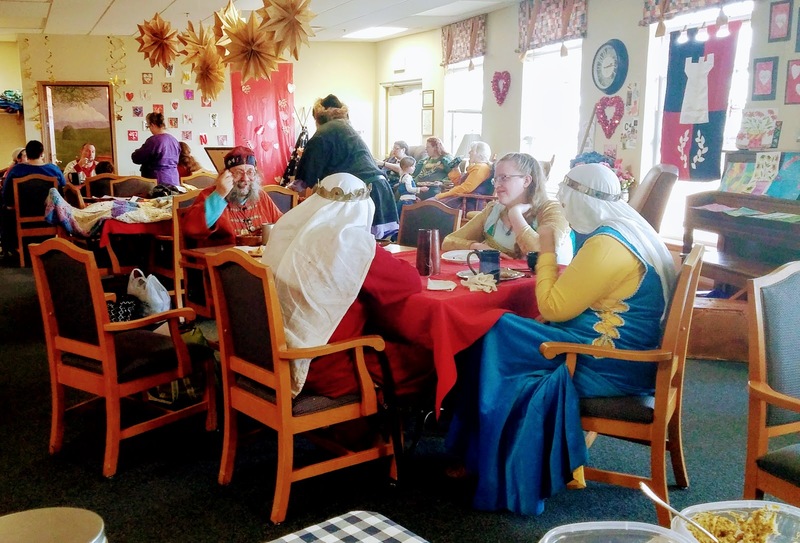 It was held in the Hillcrest Mable Rose adult daycare facility, unused by them on Sundays. A free site for us, because one of our members works there. While I'm taking pictures most people are sharing experiences, making plans for future events, and asking questions. 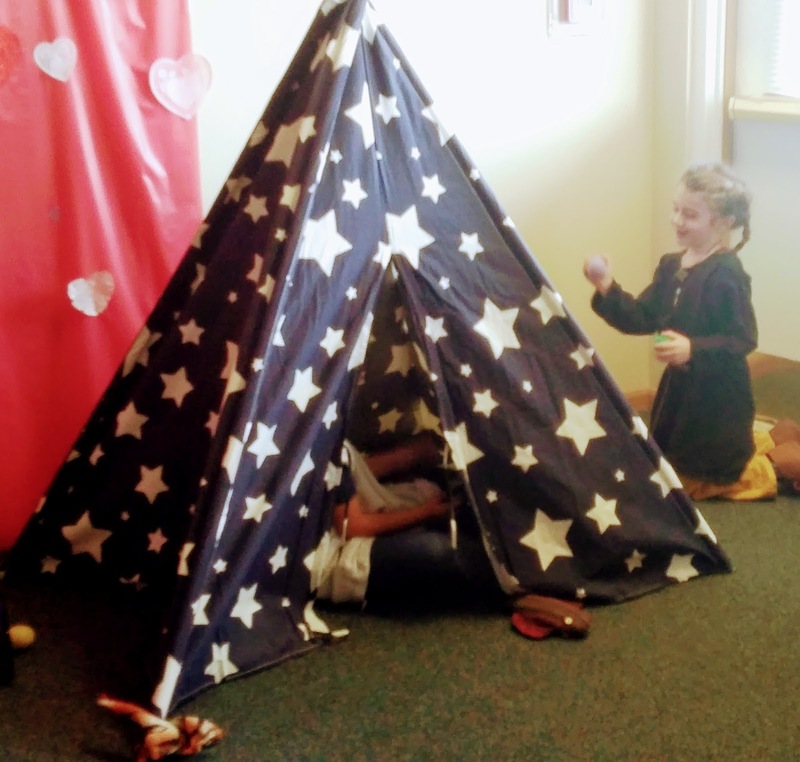 Lady Michelle brought this colorful indoor tent for the very young to play in. 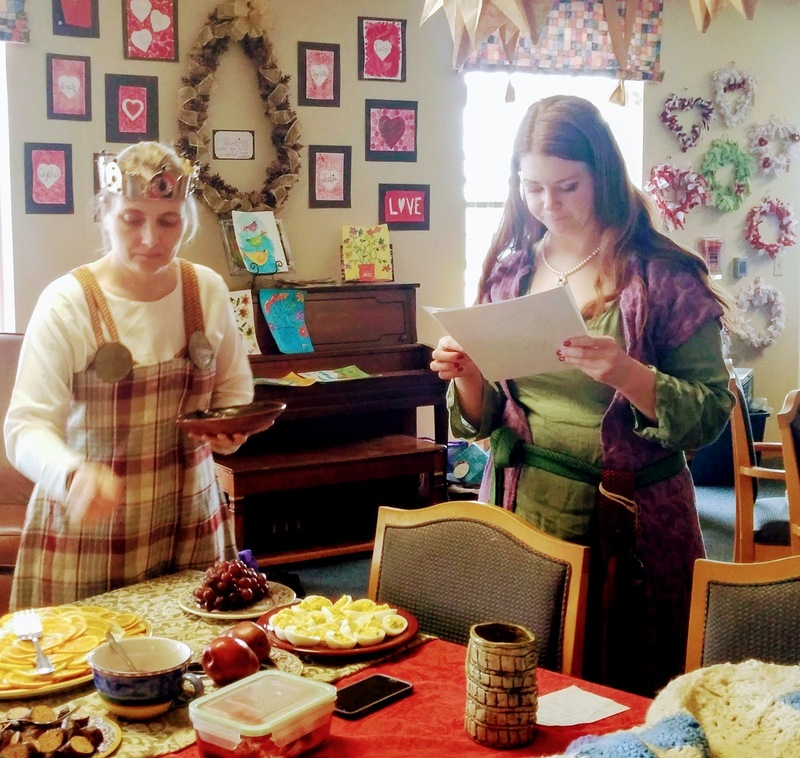 Giulia Isabella da Venezia and Lady Aleit de la Thomme, our former Arts and Sciences Champion, looked at each arts and sciences entry and read their brief documentation. They told me their selection was difficult to make. There were more entries than expected, in a mixed variety of materials and techniques. So many I was unable to photograph each individually. ...before the Baroness requested our presence at her court. Lady Cristina la Ambeler turned her postion as Arts and Sciences Minister over to Mistress Thora Sigurdardottir. Baroness Giulia announced HL Nikolai Kolpachnik Spinachev's Italian Renaissance food entry made him the next Arts and Sciences' Champion. Nikolai's entry included boiled egg whites stuffed with a paste of egg yolk, cream cheese, sour cream, and spices. The large plate held cold roast beef under sour orange and lemon slices. The small plate over the oranges offered cold sliced pork sausage poached in red wine and spices. The sauces are a sour cherry sauce for the white torte, and two mustards--one called "amicable" and the other a peach mustard. Whole fruits accompanied the cold remove. 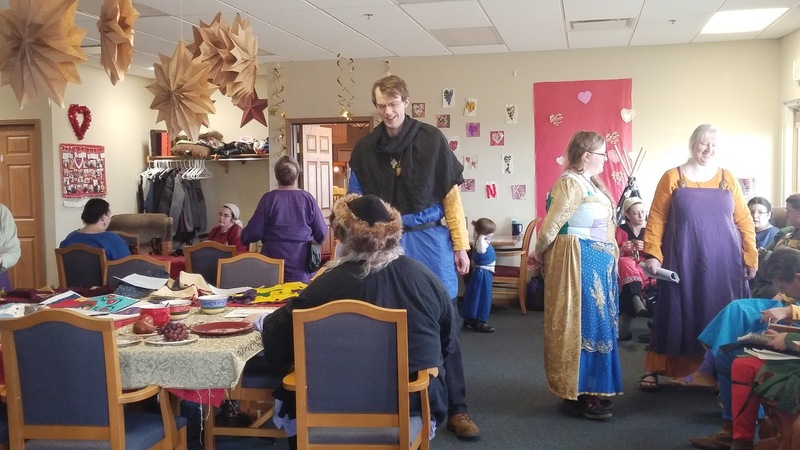 Yesterday was Calontir's Winter War Maneuvers event held by the Barony of Mag Mor about this time each year. It is a time when Calontir's army thrashes each other in melee skill practice, for the learning experience. It is a delight for attending SCA fighters. 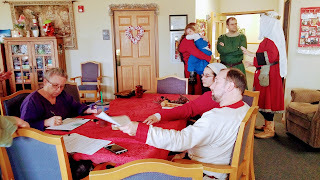 It's even important if you plan to fight with Calontir at Gulf Wars XXVI, a huge camping and fighting event hosted by the Kingdoms of Gleann Abhann and Meridies. The Barony of Mag Mor is Lonely Tower's closest neighbor and friend. We share many activities, fighter practices, event staffing, classes, demos, and friends. But, this year I didn't attend. 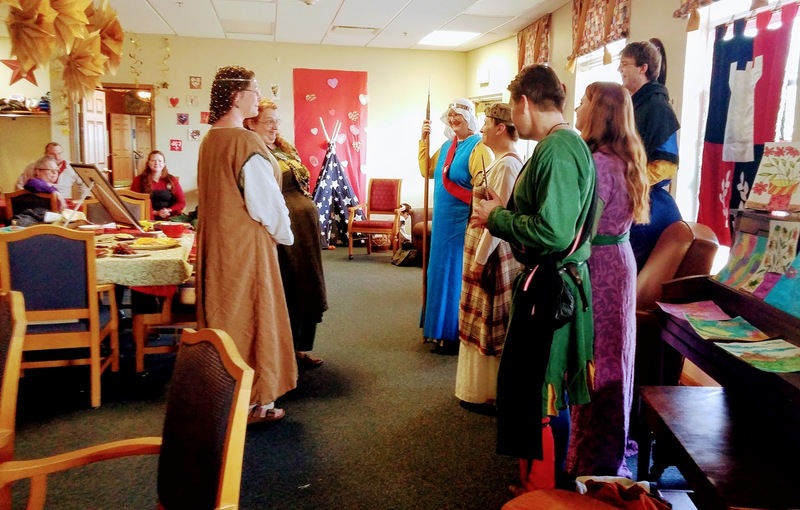 My absence has me rethinking my SCA life. I've been a member since the early 90s. I've learned volumes, as much as any college history or art degree, just not as organized. I've chased uncounted shiny metals and been diverted by them too. Today my life is nothing like it has been through my earlier SCA years. I am not able to be away from home for more than 4 hours. I no longer have a live-in dog watcher, but I have three dogs. Planning around them is trying. There are other considerations too. 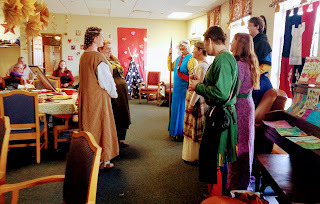 I have many SCA acquaintances, but now have difficulty making friends. Lonely Tower's remote location, without travel, limits my connections. After participating 20+ years I'm practically anonymous outside the region. My semi-anonymity limits my scroll assignments. This is sad. Calligraphy and illumination are my passion, but their shine is dimming from lack of use. Outside new sparkling attractions are more distracting. Something I never thought could happen. 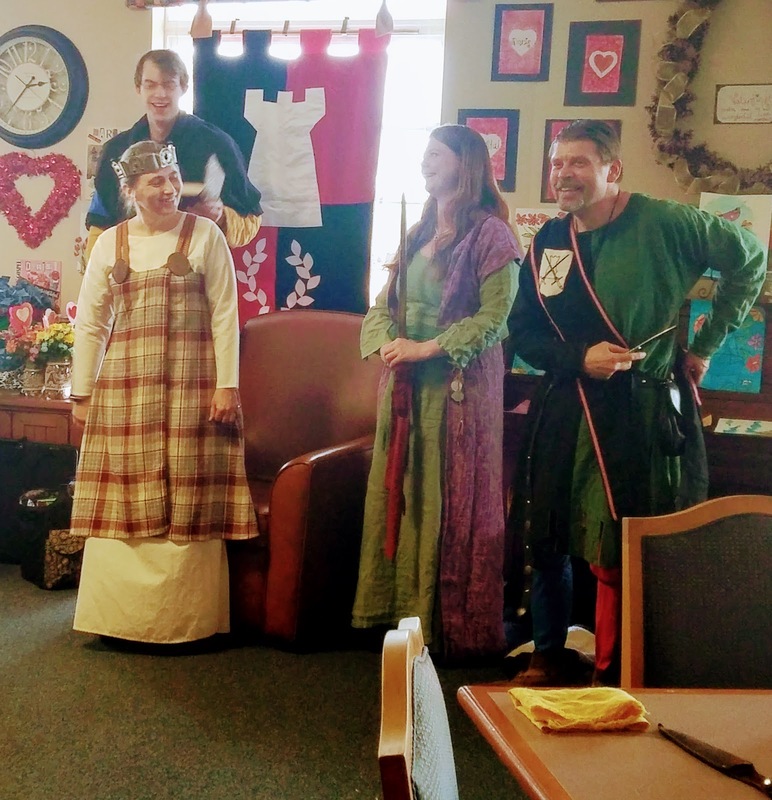 My new SCA direction emphasizes Baronial participation. 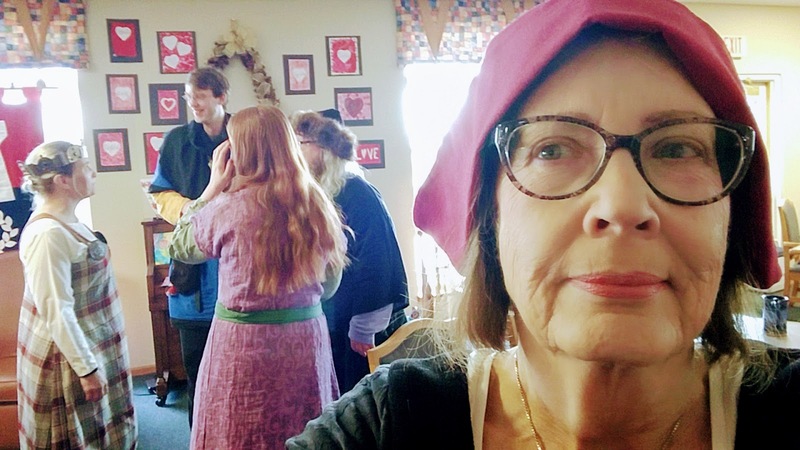 Business meetings, revels, hosted events, and scribal classes. This blog is my way to reach beyond Lonely Tower, until the time I travel to more distant events. 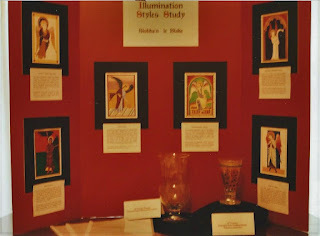 Years ago I entered my first competition with an illumination. In my documentation, I wrote about using tracing paper to transfer the image. One judge commented on my lack. I still remember how down it made me feel. The way I handled that, as I often did, was to go to the library and research. 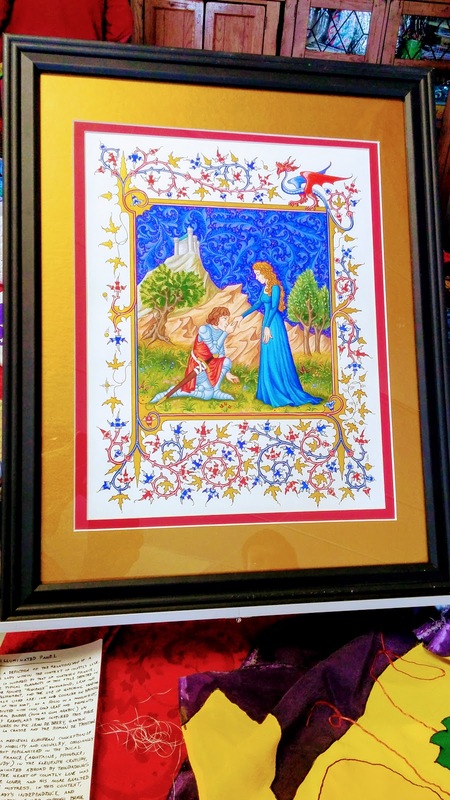 In June 1997 I wrote "Medieval Clipped Art?" 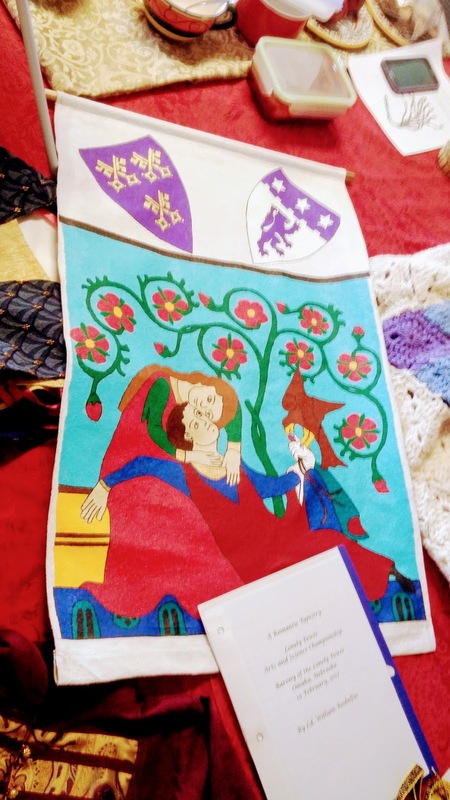 which was published in the Lonely Tower newsletter, The Banner. De Hamel also comments on it in The British Library Guide To Manuscript Illumination (p. 62) He believes there is tracing evidence as early as the 9th century, even having both the model and its copy. Direct tracing, where a model is held to a glass with light passing through it, similar to a lightbox. Pressure tracing, where a page is placed under a master and a stylus is drug its lines leaving indentations on the copy. Moisture tracing, where the master's lines are redrawn on the back and pressed to the copy. Farquahr gives two recipes for carta lustra, also writing it could be bought ready-made. He mentions the use of linseed coated paper. But he thought the best period "tracing paper" was exceedingly thin vellum. With many tracing options recommended for budding artists in the Middle Ages, what is the best criteria to judge a scribe's work today? In my Calontir Kingdom Arts and Sciences comparative study entry, I used multiple design methods on purpose. I used pricking and pouncing, tracing, copying with a grid, and drawing. 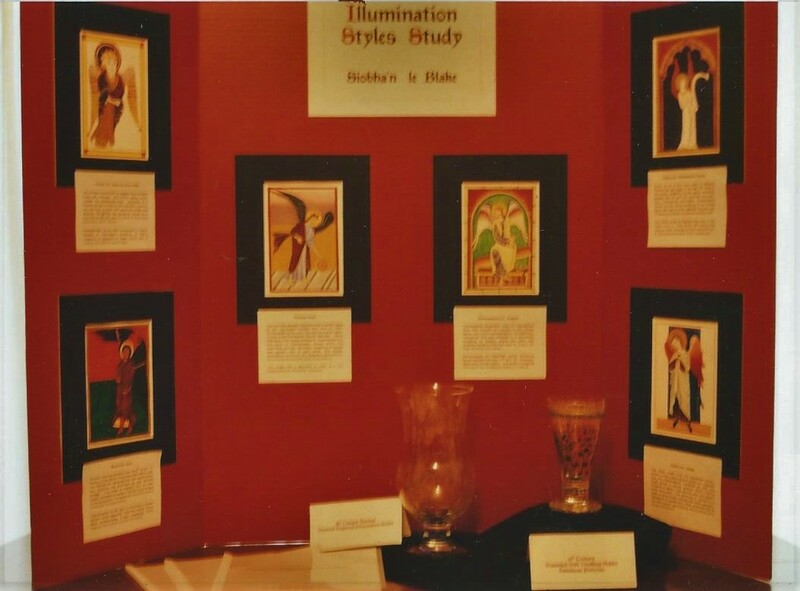 Each work was documented individually and displayed side-by-side to compare styles and results. I am confident using any method. They each serve a purpose. Today my scribal works are award scrolls. I use a combination of lightbox and free hand drawing. 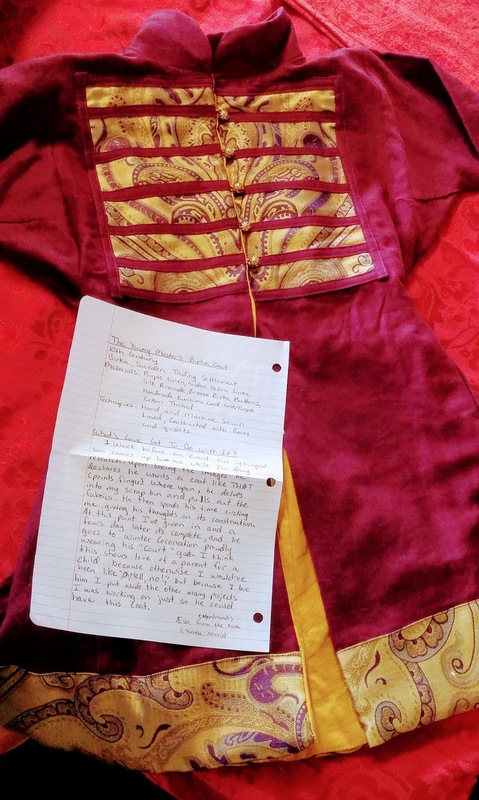 As a production scribe, the goal is to get a well done, period style scroll that relates to the recipient's award and persona by the deadline. I agree with Cynric of Bedwyn (Robert Ferrell). He aptly posted on the SCA Scribes FaceBook Group December 22, 2016 "Art comes from your heart and your spirit. It has nothing whatever to do with your chosen technique." P. S. Fortunately those old newsletters have recently been put online in pdf. To find it, if you choose, click here. Next click on June, Arts and Sciences. It's on page 19. In Chinese philosophy, yin and yang describe how complementary, connected, separate influences compel and connect. I know many such twosomes that exist. Fire and water, expansion and contraction to name two. 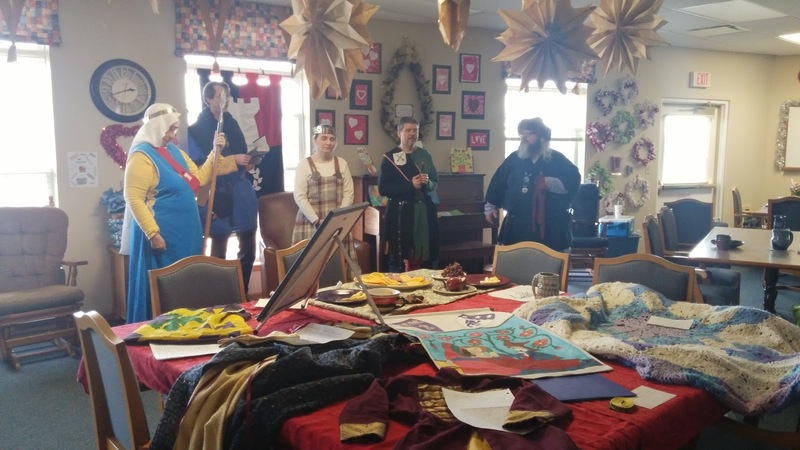 The SCA has its own. Current creation methods and historic recreation efforts. 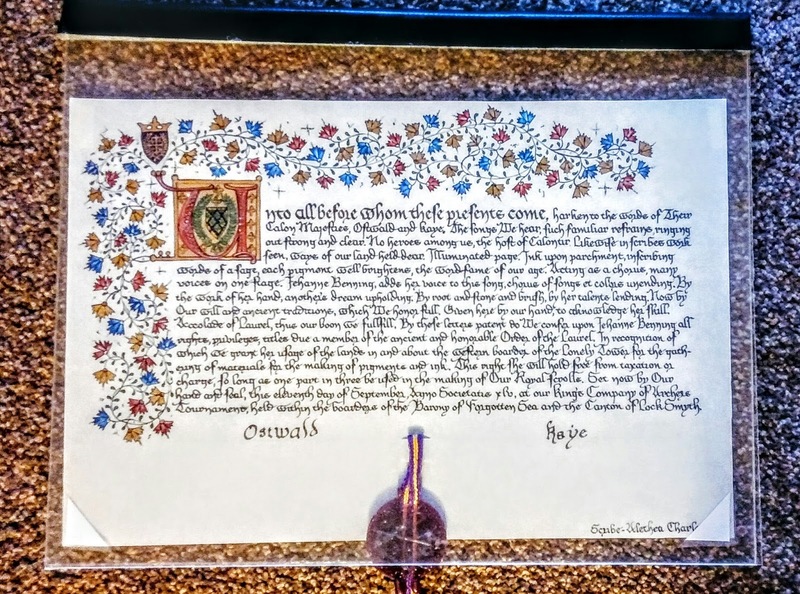 As a scribal production Laurel, I am drawn to Medieval illuminated manuscript techniques and style yet creating award scrolls commonly is done with modern materials and techniques. 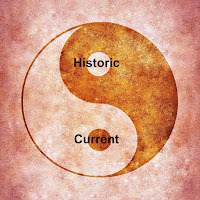 The scribal yin and yang. It is possible to work with both influences.M. Fionghuala inghean Fhearghuis of Calontir has done so. M. Sir RanthulfR AsparlundR of the Middle Kingdom has made it his life's work. But melding them is an effort. melding them together is difficult. When talking with scribes I comment on the creative and historic dual existence. I encourage them to consider their goals for themselves and for each thing they make. 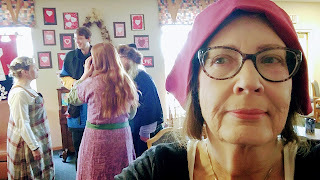 My general classes cover current scribal techniques, but I mention historic equivalents. I teach and talk about pigment production, but prefer to use tube gouache for scroll creation. These influences affect judges at SCA competitions too. In Calontir it was seen in the creativity versus historic research duality. High points in one may result in low points for the other. Is switching between the two influences enough? What else might I do? I don't have the answer to those questions. And, I have given it much thought. I would appreciate any suggestions you have. Knowing that both manuscript history research and scroll production influences exist frees you to choose how you want to progress. Combining them into one creation is daunting, especially under a looming deadline. As you read this blog, the important point is that you become keenly aware there are two forces that influence an SCA scribe. Two forces with which to become comfortable. Like the yin and yang, the more you acquire of each and meld them the better for you. 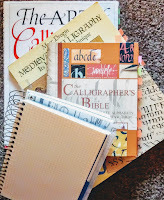 I've collected numerous calligraphy manuals over the years, searching for tips and tricks to improve my lettering. As an SCA scribe, my book criteria differ from calligraphy books for modern works. Here are my preferences. The book should focus on the nib-lettering technique I want to learn. For most of us in the SCA that is lettering with a broad-nib pen, rather than a pointed nib. I have enough projects to letter without learning a Spencerian script. The scripts included should be those we commonly use. 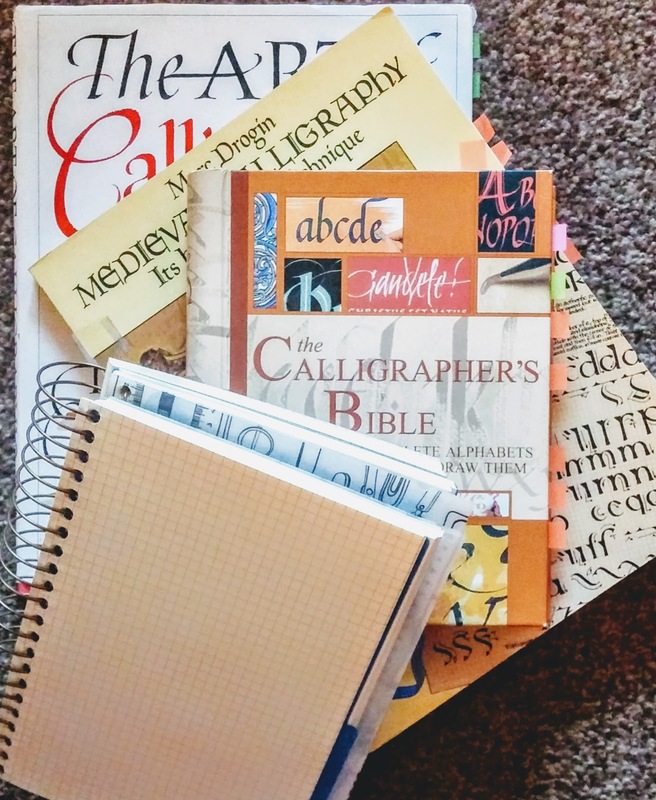 While your choices may be different, my option list includes: Roman, Half Uncial, Uncial, Caroline minuscule, Foundation hand, Insular majuscule, Protogothic minuscule, Gothic textura quadrata, Gothic quadrata prescisus, Lombardic capitals, Secretary hand, Secretary capitals, Frakture minuscule, Frakture capitals and Cadels. The book should focus on basic, formal lettering strokes rather than stylized art forms. The more facsimile reproduced images included the better. If the image is actual size and I have a pen nib that matches it I can practice using my lightbox and tracing over the letters, especially the serifs. The pen angle, nib width count, and ductus should be clearly shown for each calligraphy style. The more period photographs the better. These criteria cut out books which detail using a brush or oblique pen and cursive or artist designed letter styles. For its size, I also like The Calligrapher's Bible by David Harris. ISBN-13: 978-0764156151 It has the broad-nib styles I use and shows their ductus and pen angle. Its 7"x 8" spiral size allows me to use it open by my work space. But it does not have photographs. Its historic information is appropriate, but not detailed. Still it is handy and may be a book you want to add later. Like the seven deadly sins, art media have behaviors that are a challenge to overcome. The key to dealing with them is avoiding or limiting their effects. As a scribe, I've messed up work every way possible. Those were my gouache learning experiences while detecting its sins. Let me tell you what I've found. An upper gouache layer may re-moisten my underpainting. 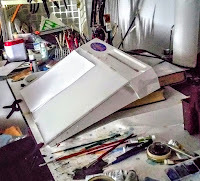 --When possible, I let my work dry overnight before adding a stroke to an upper layer. --I make sure my strokes are what I want before I make them and leave them alone when they're done. Over-working gouache mixes and blends the layer's colors. The scroll or picture surface is easily damaged. 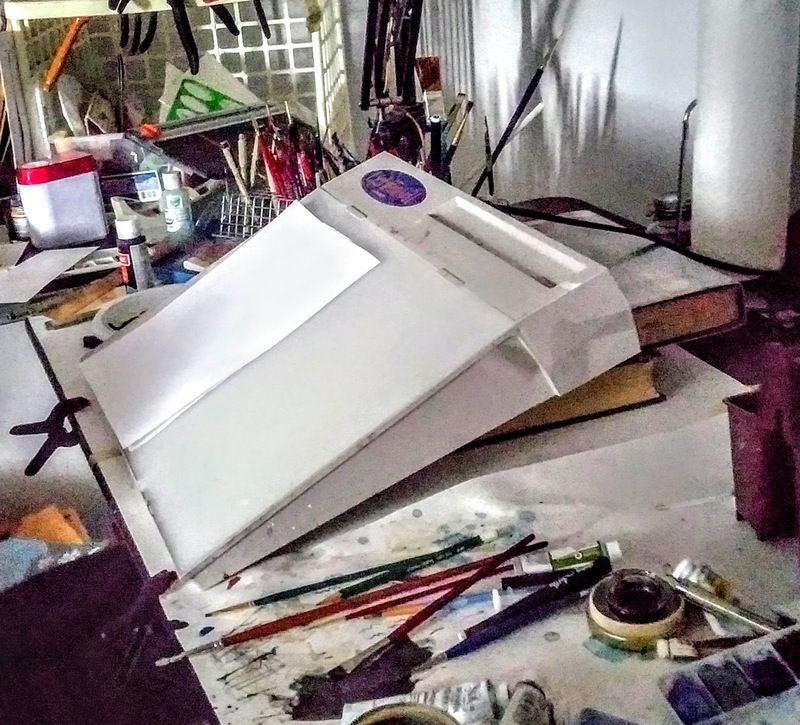 --Gouache paintings are brittle. After being almost done with a picture my cat walked across it during the night, leaving marks to for me to correct. I now take precautions to protect my work. I've used several options: plastic sleeves, frames with glass, cloth covered cardboard scroll covers, and double clear plastic display "books". You probably have other ideas to try. The opaque gouache hides my underdrawing. --I keep track of key points as I build my layers, particularly when painting fabric drapery. Repeating patterns are less a problem. --Sometimes I lightly redraw lines. The underdrawing shows through my underpainting. --Opacity varies between gouache colors and brands, especially student paints that have less pigment in their binder. --When I don't want to change paint, I cover the area with titanium white. --I keep plenty of paint in my well, so I don't run near empty, causing less pigment in the binder. There are infinite color options. --The enormous gouache color variety makes it difficult to know which is the most practical paint to buy. It's like limiting yourself to one Christmas cookie at Grandma's. --You can paint almost anything with six colors, including black and white. I switch colors when I empty a tube, often due to price. Gouache changes value when dry. --Dark colors lighten and light values darken. I noticed this more in a large, flat area. In that case, I make sure I have plenty of paint to cover my chosen area, especially if I've mixed colors. This became easier with practice. The "periodness" of gouache is debatable. Modern gouache has similarities to some late period paint recipes. Those period paints seem more used for highlights. Without broad scientific study over eras and locations the reality remains fuzzy. 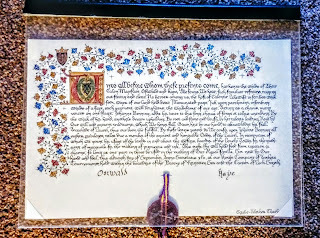 I use gouache paints for my SCA scrolls because they are convenient, not because they are exceptionally period. When creating scrolls, the benefits of gouache paint exceed its detriments. 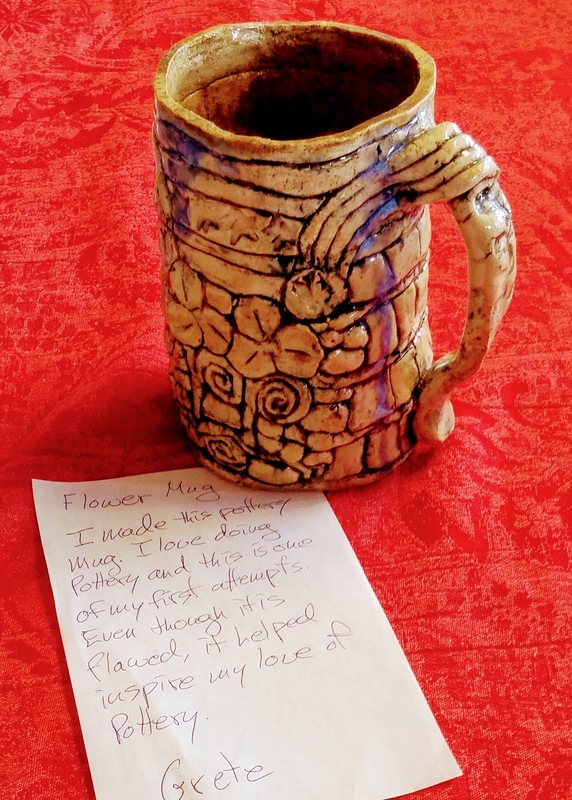 Purposeful scribes work with its quirks. Why Buy More Scribal Paint Colors?